Ok, today is actually January 7, 2010; started this a week or so ago and have just been too depressed to write, so since I'm making jewelry today, I think I'm in the mood to post. 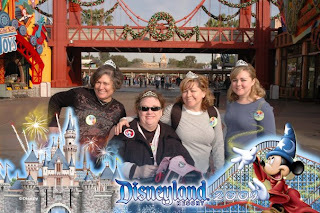 I went to Disneyland/California Adventure (the week prior to the week of Christmas) with three of the funnest and best friends anyone could ask for. My BFF (although WE invented that in the 70's but called it "forever and ever best friends", back in the days of the Postal Service, LONG before texting) of 35 yrs treated me to this trip for Christmas. 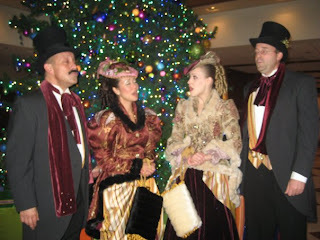 Disneyland at Christmas is MAGICAL, and the first thing we saw, when checking into the Paradise Pier Hotel, was a quartet of carolers in Dickens-age ensemble (said with a French accent), caroling in front of the HUGE Christmas tree in the lobby. They were so beautiful and sang so beautifully, it made me cry. I made a bunch of pink ribbon bracelets to take, in hopes of noticing people who might be going through cancer, or over hearing a conversation, or something. I wore them around with me, and my friends wore one around too. I think only Raila kept hers, and I have since given the rest away, sorry girls. BUT, I gave one away to a young woman in a crocheted hat with a blue awareness ribbon on her bag that said "survivor". I asked her if she was a cancer survivor, and she was, but didn't go on to any details as we were, at the time, exiting the FABULOUS Aladdin on-stage production. I told her I was a survivor as well and asked if I could give her a bracelet. All very rushed as we were exiting. On our very last night there, after the WONDERFUL Christmas parade down Main Street, we decided to RACE back over to California Adventure to try and ride the roller coaster one more time, at night. Well, when I say race, I mean RACE! Four people dragging one another along just wastes time, so these friends say, "Meet at the "R" in front, ready-set-go! ", and everyone runs and zigs and zags...great fun actually, especially since I was on a handicap scooter thing!! Boy zigging and zagging can be tricky in that thing! Yet, I always got there last anyway....and only a few people yelled at me. (But I did NOT flip anyone off as I zoomed away, since, after all, we were in The Happiest Place on Earth.) SO, as I was zipping down Main Street, a woman stepped off a curb and I almost ran her over...apologies, apologies, and we go on our way, and then the back of my mind registered two things: she had very short hair, all over, like when it's just growing back, and she was wearing a surgical mask. No one else in the park seemed to be still that frightened of swine flu, so my brain, in that split second, knew she had to be a chemo patient. I pulled over to the curb and waited for her and her daughter to catch up to me. I reached out and touched her arm, and I don't remember what I said, something like asking if she was in chemo, told her a brief one sentence synopsis of my story and asked if she had breast cancer...she said no, Leukemia. I took off one of my bracelets and put it on her sweet wrist and said to remember all the people who were pulling for her and thinking of her. She teared up and hugged me tightly and thanked me dearly. In that hug we shared that common bond and I hope I gave her some strength. It was the best moment of the trip, and I will never forget her. As far as the rest of the trip, they say laughter is the best medicine, and I have not laughed that much since I was a teenager and hung with Becky on a regular basis. I'm sure I talked Jeriann's leg off, though she said she liked it because it helped her fall asleep! HAHA!! We laughed, and joked, and took silly pictures. It was the greatest. More fun that I have had in years and years, and all because of the people I was with. I had an oncologist appt shortly after we got home, a few days before Christmas. I made another bracelet, so I had three, and I asked the nurse at the end if I could go over to the chemo side to look for people who needed cheering up. There all together at the end of the room were three Breast Cancer Fighters, and I was able to give each of them a bracelet. One stood up and hugged me, the other two were already hooked up to stuff. I think the last lady I gave one to, who was reading a paper at the time, not noticing her surroundings, was very touched by it as I left. I know I felt good. Doctor said I would be called to schedule another PET/CT scan in January....tick tick tick. I took him yummy hot chocolate from Starbucks, which I'm sure was cold by the time he was able to taste it, but he said he is used to warming things up. He wants me to think about Zometa (? ), but I said I wanted to see another scan first, or do a bone density test first. I haven't done much research on it as I've been busy being quite depressed for the past few weeks. I started on making bracelets again, and churning my head for how to get the Dirty Pink Underbelly thing going. Also decided to change "Survivor" (for those of you who haven't heard me gripe on about this before...since I have cancer again, I've been kicked out of that group, and seriously, you can't really know that you've "survived" it until the day you die of something other than cancer!) to more of an action word; "SURVIVING", which each of us touched by cancer, no matter our stage, is doing daily. It's my quest, my mission. If I can get through the depression of working out my finances, etc, then I shall stop being a depressed ninny and give it my all. I do still want to die soon, don't get me wrong there. Just don't want it to go to my lungs!!! Poor Annette has suffered so much with that! Stay in my bones and then migrate over to my liver, spread like crazy and kill me fast. That's my plan. Now I just have to figure out what it is I have to finish up here. I think I cried about this the other night. Feeling better today, because it's been two days since I dealt with the mortgage counselors/making home affordable blah blah blah. There are three things I need to get done and fax over. Today being Thursday, I should probably get on that; but one is a "hardship letter"...geez, can I just send them the link to my blog? That one will be hard and make me cry and feel angry.